Many condolences to jouster Sean Gulick who lost his horse, Oberon (aka "Bo"), to severe gas colic yesterday, on July 14, 2013. What makes this loss even harder is that Sean, who is a geophysicist, is currently working on a ship off the coast of Alaska and was unable to say goodbye to Bo in person. 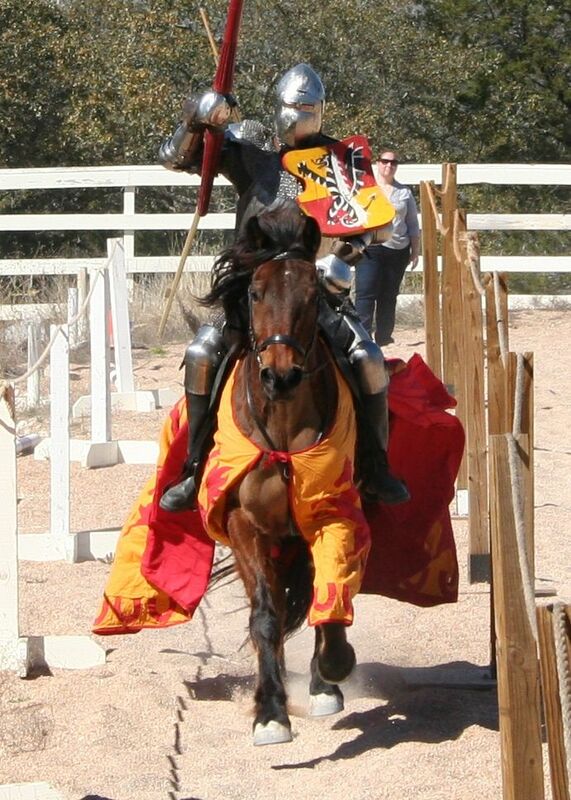 Oberon was not a jousting horse for very long, but he was a great sport about all things jousting from the beginning and was an all around sweet horse. According to Sean's wife, Jennifer Jobst, who also rode Oberon for dressage and fox-hunting, "His time with us was too short and he will be sadly missed." "Oberon, aka Bo, was an 11 year old, 16.1hh Standardbred/Percheron cross. He was actually a PMU baby imported from Canada as a weanling. He was my fox-hunting and jousting horse, and was brilliant at both. He was fearless about jousting, but pretended to be terrified of random things like gates, wheelbarrows and manhole covers. My wife and I were fairly certain that he practiced cute/handsome looks in the mirror so he could con unsuspecting passers-by into giving him a treat. It usually worked!